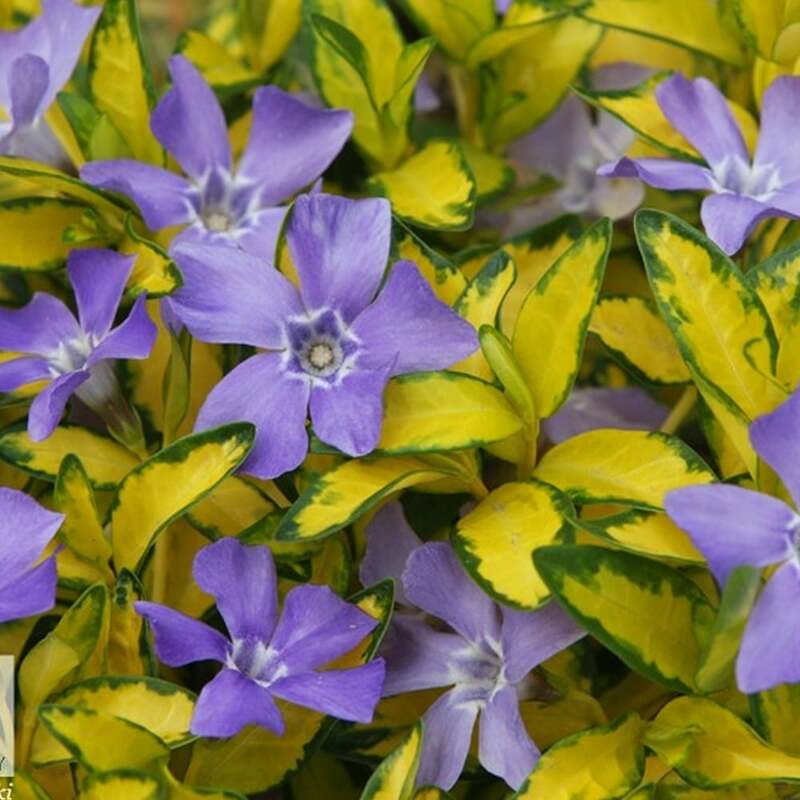 Vinca Minor Illumination is an evergreen perennial that features bright golden foliage with showy blue flowers. This low growing and spreading bush will quickly take over any available garden space, making it perfect for groundcover and suppressing weeds. This is a highly ornamental plant that carries year-long garden interest and its carpet forming habit creates a dense mat of glossy evergreen leaves. Lesser Periwinkle Illumination, also known as Creeping Myrtle will create a lush garden effect. It produces star-shaped blue periwinkle flowers that are showy and flourish throughout summer and sporadically into autumn. The bright variegated foliage of Illumination is no less impressive. It produces bright golden leaves margined irregularly in green. The blue flowers decorated with golden foliage sets a beautiful floral display that is very eye-catching. Vinca Minor Illumination blooms for a long period of time. It is not just another garden ground covering plant, it is tough and hardy perennial that will thrive in full sun or partial shade. It prefers moist soil but will grow just fine in any soil that is well-drained. It can tolerate shade, therefore used to brighten up shady areas of a garden. Vinca Minor plants grow highly tolerant of urban pollution and drought at the same time. They will thrive perfectly in inner-city environments. These are low maintenance plants that do not require any specific pruning every season. If left untouched, this plant will grow invasive, taking over any open areas, creating a hindrance for other low growing plants. Nevertheless, Vinca Minor Illumination is an excellent shrub for groundcover and for container planting. Use them as spillover plants in hanging baskets.